Celeb Gossip News – What is Crohn’s disease? Symptoms and treatments revealed – are you at risk? Crohn’s disease is a long-term condition that’s caused by a problem with the immune system, according to the NHS. It could also be caused by smoking, an abnormal balance of gut bacteria, or even by a stomach bug, it added. As a type of inflammatory bowel disease, Crohn’s disease symptoms can include a pain in the abdomen that’s usually triggered by eating. The pain may also be caused by passing a stool, as it’s usually accompanied by diarrhoea or blood in the stool. Extreme tiredness or fatigue are also signs of Crohn’s disease, said Dr Gareth Parkes, Consultant Gastroenterologist at Barts Health, and spokesperson for charity Crohn’s & Colitis UK. “It’s important to remember that everyone might experience slightly different symptoms – some people with the condition may experience weight loss and loss of appetite, but for others this might not be a problem,” he said. Some patients have reported a high fever, joint pains, and vomiting, said the NHS. Patches of painful, swollen skin on the legs or mouth ulcers may also be signs of the disease. Children with Crohn’s disease may even grow slower than usual. Speak to a GP if you find blood in your stool, if you have diarrhoea for more than seven days, or if you have frequent stomach pains. The doctor will try to find the root cause of your symptoms. That may include a blood test, or even a stool examination. Parkes said: “If your doctor suspects you have Crohn’s disease, you may have to undergo some tests and investigations to make sure you have a correct diagnosis. 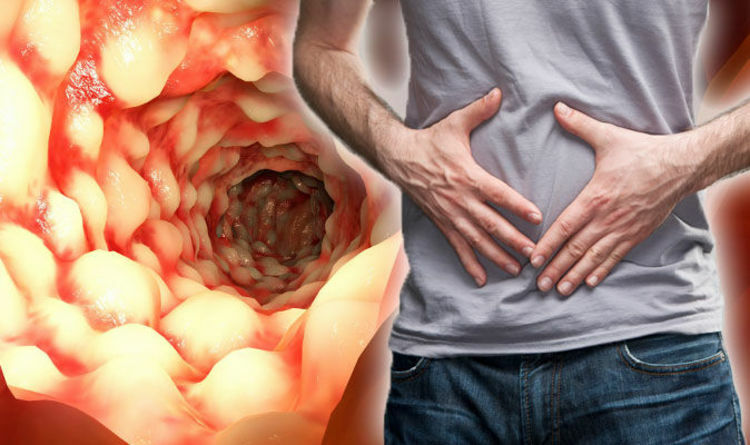 “These can range from blood and stool tests, which can highlight if you have inflammation anywhere in your body, to endoscopies, which involves a specialist doctor looking directly into the digestive system using an endoscope [a long thin tube with a camera on its tip]. There’s currently no cure for Crohn’s disease, but treatments can help to reduce symptoms. Anti-inflammatory medication – including steroids and immunosuppressant drugs – may relieve signs of the chronic condition. Some patients may require surgery, although that’s a last resort, said Parkes. Certain foods may be triggering a flare-up of symptoms, so making some small diet changes may reduce symptoms. Finding the right triggers is crucial to relieving signs of Crohn’s disease, but each patient may have different triggers. “When it comes to food and Crohn’s, it is finding out what’s right for you,” added Parkes. Crohn’s and Colitis UK is the national charity leading the battle against Crohn’s Disease and Ulcerative Colitis. For more information and support please visit Crohn’s & Colitis UK – crohnsandcolitis.org.uk or phone their information line 0300 222 5700. No, Idris Elba Isn’t In Talks For James Bond Red Dead Redemption 2 release date: When is it released - Did trailer reveal new gameplay?